Considering that he is our one son that cares about fashion, that sparked this post since I’ve pulled out my own plaid and I am on the hunt at thrift stores for those that have been lovingly discarded. 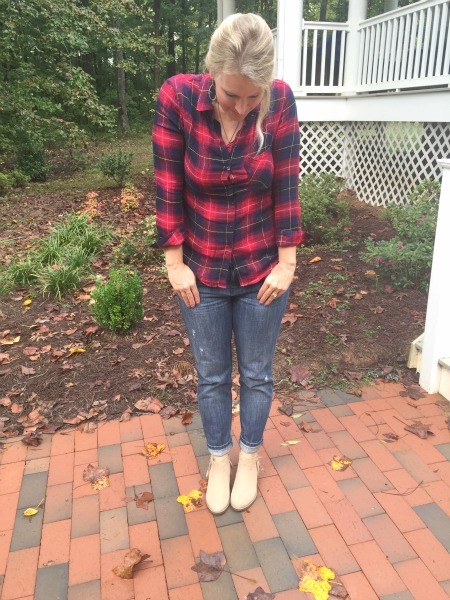 Yes, wearing plaid shirts is one my Frugal Fashionista goal this month. 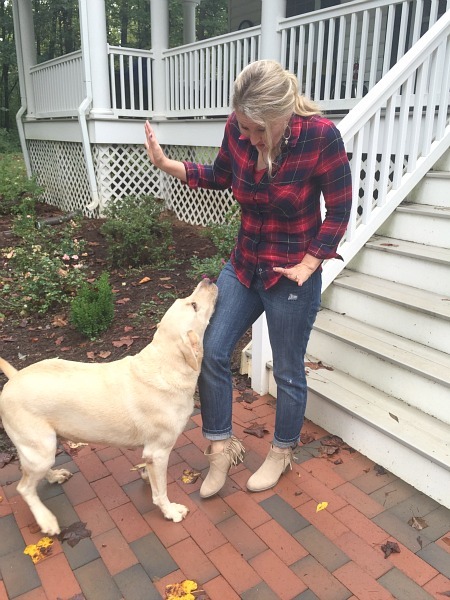 It’s so easy to look great with just a fun, flannel (plaid) shirt. 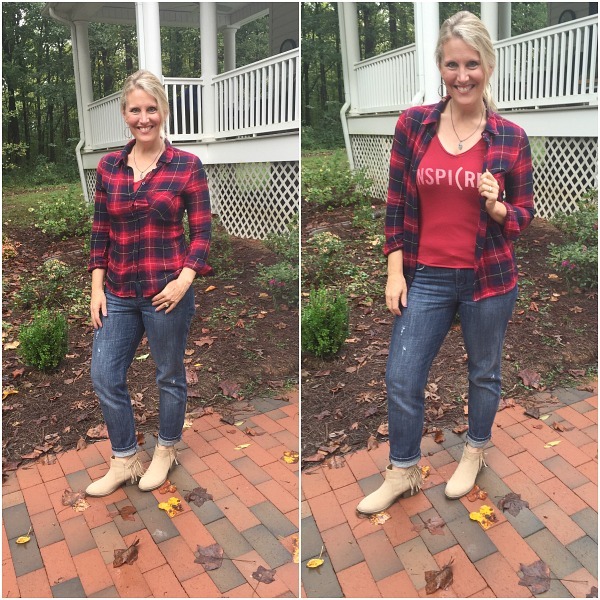 I definitely didn’t plan on having these make it to a Frugal Fashionista post. These are my “around the town for errands” look and obviously, not a day I was caring about hair, make up etc. but I guess that’s why I love it now and why I had my daughter spontaneously take these pics. 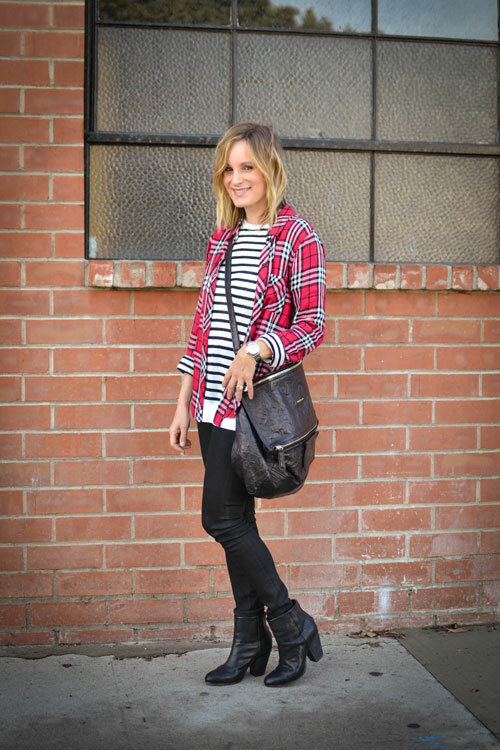 We can all dress up our errand look with just a few additions. Add some boyfriend jeans and fringe and you have three of the fall trends met in one cozy and comfy outfit. When I went thrifting last weekend, I found these Loft boyfriend jeans for $5 and the flannel shirt for $3.75 Right now, I’m on the hunt for plaid, gingham checks and flannels. I’m not even looking for anything else, just rushing into Goodwill, scanning the tops for prints and heading out. 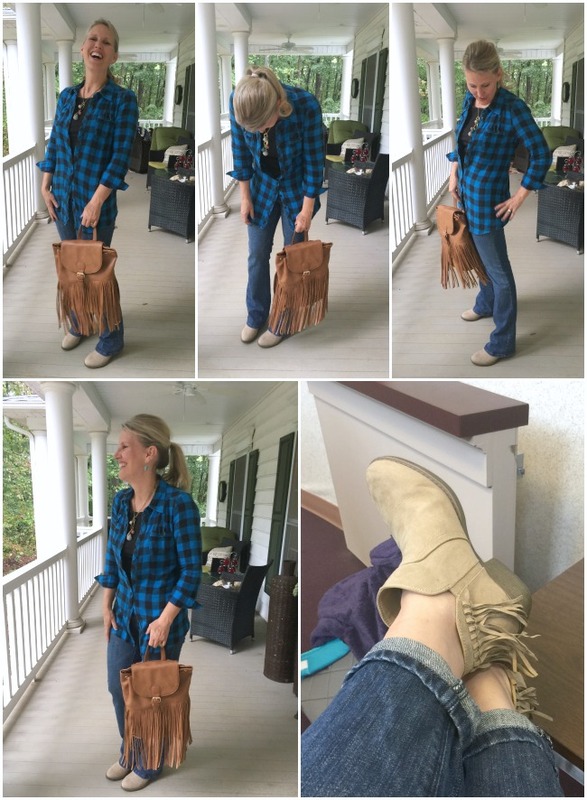 I adore these fringe booties from Payless. I got them for a steal and short boots are so popular right now. They have some great variety, plus this fringe backpack/purse (below) adds such character. My 12 year old has snagged it for herself and insists that moms should not be wearing backpacks, but I think it’s darn cute. Also, did you know that flare jeans are back in this season? Yep, if you have any stuck way back in your closet, pull them out. Any kind of flare goes this year. Wearing a plaid shirt under a fur vest is the perfect mix of casual and glam. 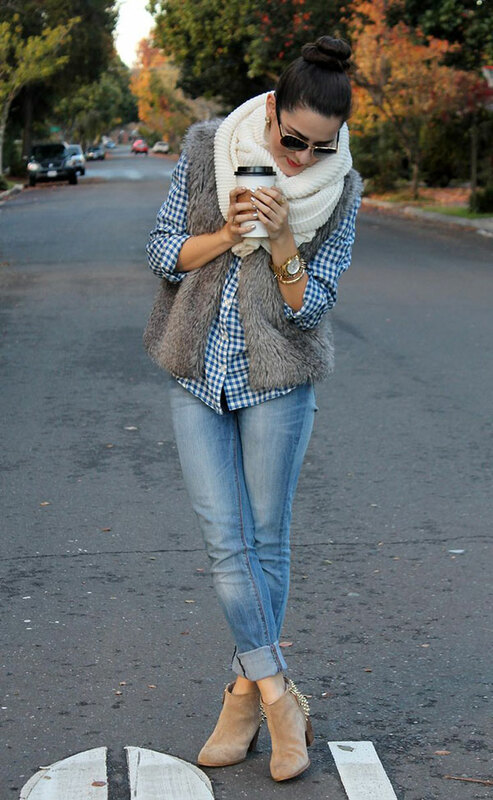 I love this and am super excited to try this look because I have the jeans, booties, plaid shirt and fur vest. Remember the one I snagged last year? I’m excited. This is the same concept with the vest, yet it carries much more of the casual look we are used to when layered under a puffy vest. We know if Taylor loves plaid, we are in good fashion company. It’s also the perfect time to bring out those long boots, because this is an easy win! Sometimes we all just need a little inspiration and that’s why this post is fun for me because I’m getting inspired too. I would never have thought to take plaid to this next level and it’s gorgeous. They are truly dressing up a casual look to something so fabulous. Do you sense a trend? Statment necklace with plaid works! Next is something that I am struggling through, but I want to master. It’s that of mixing and matching varying patterns. I LOVE it when I see it on other people, but when I try to do it myself, I have to force myself out of my comfort zone because it doesn’t come naturally. Yet, it’s bold and fun, so let’s try it together. 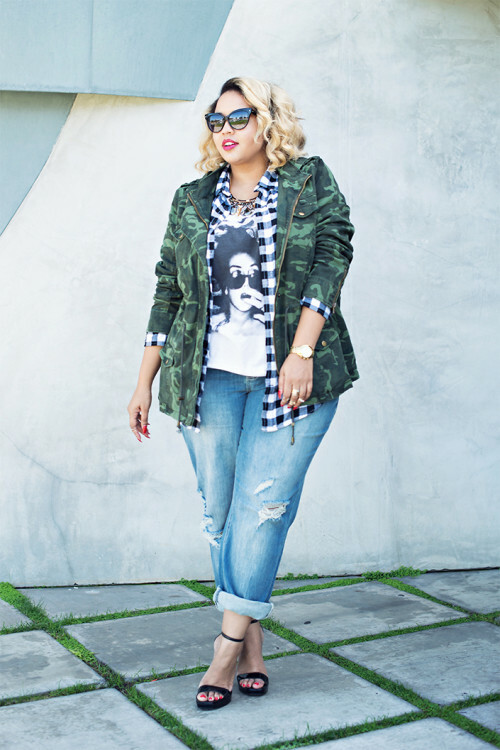 Who would ever think to layer camo, plaid and a graphic tee shirt? 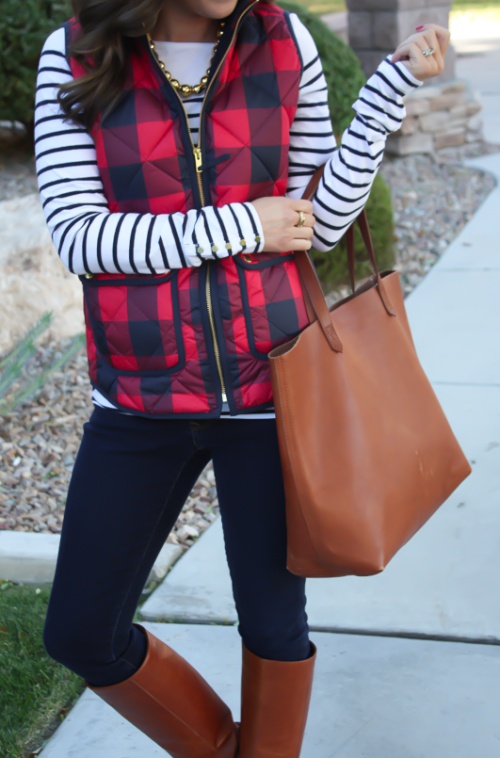 Plaid under stripes? It works and is just adorable! Now that we all officially want to storm Goodwill to see if we can find any more, I hope you’ve been completely inspired to dust off those old plaid shirts, raid your friends’ or hubby’s closet and enjoy this great look this season. I’ll leave you with why I could never be a full blown fashion blogger when I have dogs and kids. 😉 Good thing my professional photographer (my 12 year old daughter) has a funny sense of humor. She LOVES to keep taking the pictures when I don’t know. Our poor dogs have been in their kennel because it has been non stop POURING here in NC. They were so happy to see me but they were getting mud everywhere. Have you found any fun, frugal finds lately? I’d love to hear. Plaid is one of my favorite colors! I second the Costco vote — I saw nice looking plaid flannels (pretty colors) there last week. My daughter just thrifted a cute fur vest very like the one you show in your example. (It looks great on her, but makes me look like a middle-aged yeti.) These are all very wearable looks. You have really inspired me to try to make more effort in my overall look. My usual effort is a t-shirt with the name of our hometown somewhere on it and jeans! So I have discovered that I am a “cool”, which must be odd since I’m a redhead. Every online test I look at wants to make me a warm due to my red hair. But on top of the veins/reflection/etc that make me a cool, I have always been most complimented when I wear those cool colors. Anyway, I went and got a few things at Goodwill a couple of weeks ago. Now I’m laughing because in high school I wore plaid constantly and all of my friends were always telling me to branch out already. Now it’s “in” and I don’t own any (aside from an old one I wear to the barn!). haha! Just want to say thank you for pushing me out of my comfort zone. I really feel a lot more confident now! What a difference clothes can make (even if you don’t spend much on them). Any idea where you found the fringe backpack? It is adorable! Thanks for the inspiration. Thank you and thanks for the money-saving tip! I loved this article! I love plaid flannels, and I noticed they were coming out as a fashion item. I’m in my early 40’s, and we wore these just because they were comfortable and the men’s always looked cute (we did the oversized look back then right?) But I love how they are cut for women now! You look so cute, I’m going to pull out my husband’s again and check out Costco as well. I think I saw them for $14-15 in my area. How about the plaid dusters? Those are cute too right? Where to get them frugally? Yay! for sure I want to try it with the faux fur vest. I’ve been debating getting one, but now because of your article and the really cute pictures your daughter took, I’m going out to get one! And to get something fringe-y, AND the long necklaces with charms. 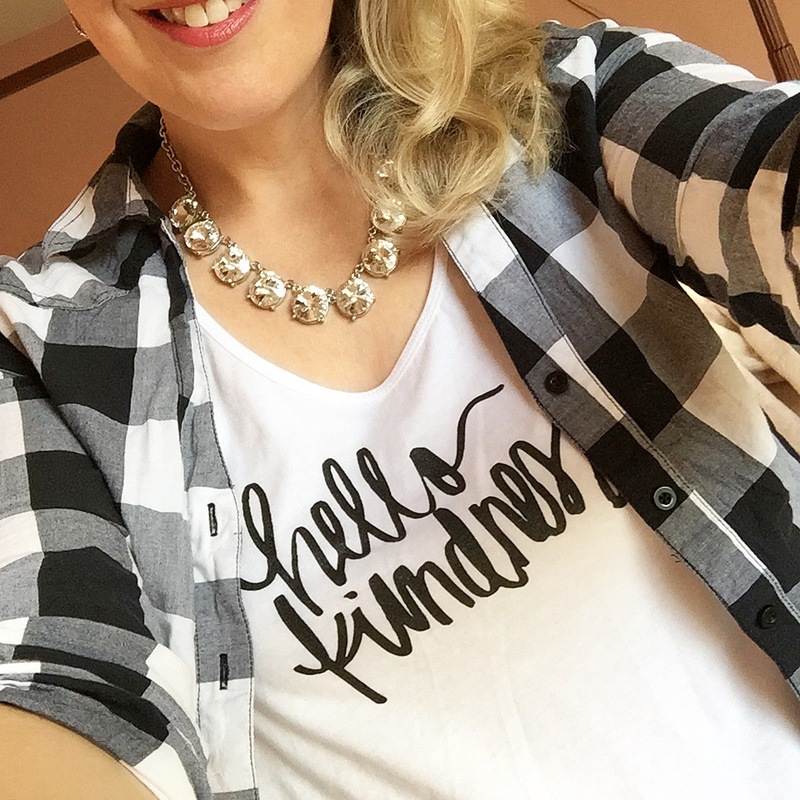 Love thrifting, fun blog and loved that you showed a plus model. Wanted you to know I could not scroll thru your blog on my iPhone without being directed to AT&T 5 times. Very unusual and unpleasant. I understand advertising for sure, but when it compromises the enjoyment to that extent it feels wrong, just FYI. On other sites in careful where I finger to scroll but didn’t matter on your blog I was thrown out 4 or 5 times. Great blog still. oh that’s so frustrating to me too, Carol, because I have specifically blocked annoying ads like that. UGH! So sorry and I will follow up on that because no advertising is worth that experience to me. Was it a big ad across the screen or can you share were it was so I can try and figure it out because they are violating my requests? That should not happen and when I tried to look for it, it didn’t show up. Also, are you using the mobile view or do you view it how it looks on my blog? 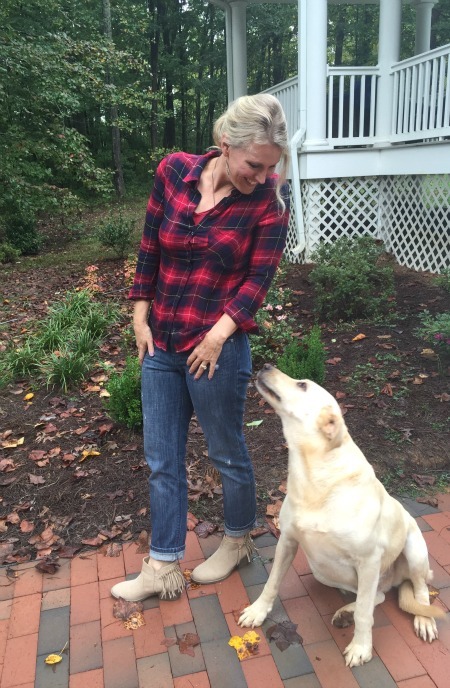 You look great in plaid! 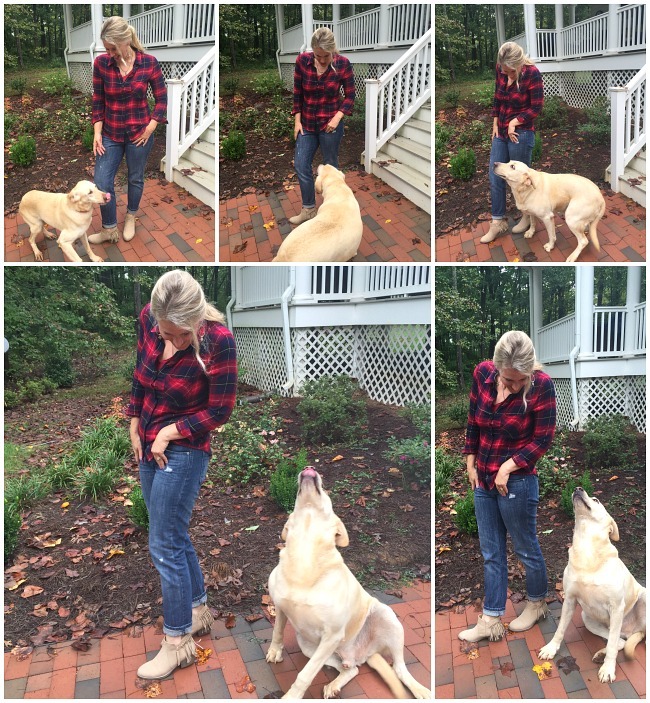 I’d recommend styling the red plaid shirt with one more button undone for the most flattering effect. 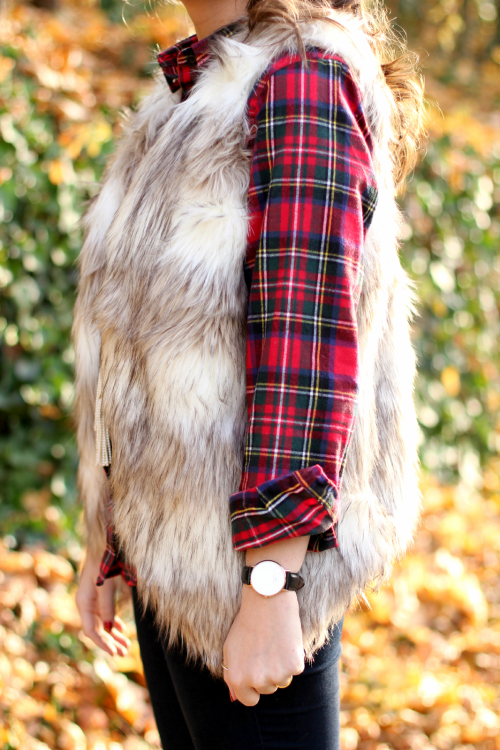 I LOOOOOOVE those faux fur vests, definitely on my fall want list. 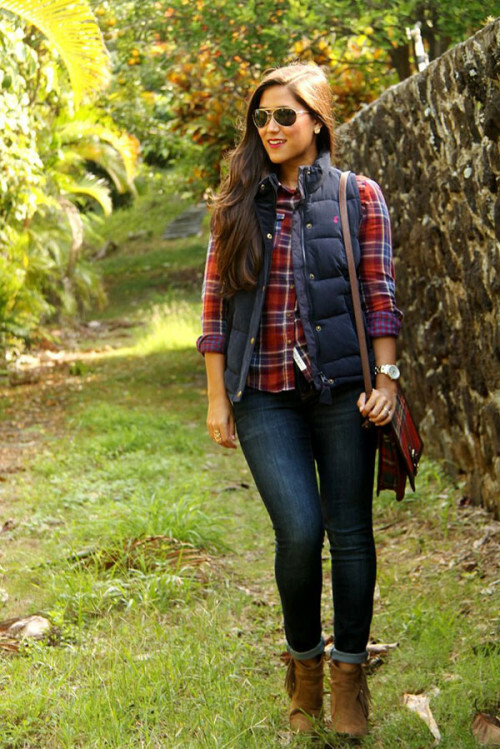 Thanks for compiling all of this fantastic fall inspiration. Love this post. I’ve been waiting for plaid/flannel to make its comeback. This fall is going to be even more beautiful then normal. You make these looks great and effortless. Thanks for the ideas. Too funny. I have been stalking thrift stores and rummage sales for women’s plaid and checked shirts, too. Kicking myself for getting rid of all mine in my 20s along with my black fringe boots. LOL. Have not had any luck yet. I did score some brand new never worn black suede booties and a pair of brand new Ann Taylor Loft skinny black jeans at thrift store. 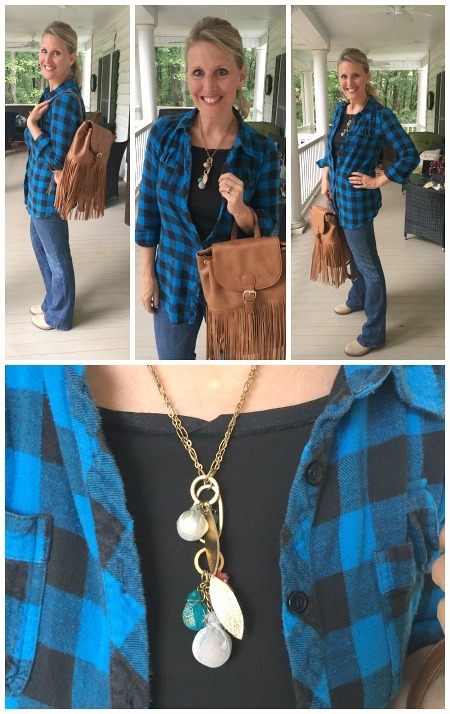 I love flannel shirts and will be taking your tip about wearing some bling with it. Thank you! Lots of cute pictures in this post. Jen-you look great in red! I don’t think the two shades of brown are a big deal, you can do it! Also, you’re not too old for the backpack-I think your daughter should share it with you. With my second baby, I found a black diaper bag backpack at TJ Max that I LOVED! I don’t want to tell you how old I was when I had him because you might say that is waaaay to old to have a baby! Oh well, my baby will soon be driving and I will be close to collecting social security when he graduates highschool. If I had a diaperbag backpack, you can have a purse back pack. Isn’t that kind of like a hobo bag? Happy New Year!! Oh Ann – loved reading this and I would never think you too old. I had a pregnancy scare recently. It’s amazing how I planned my entire life estimating how old our child would be when we turned “This age” etc. My panic turned to excitement and then Ic an’t even tell you how disappointed I was when I found out I wasn’t. Every child is a blessing.